Choose Tools > Share Document. In the window that appears, select the checkbox. Also note the highlighted portion of the text. You'll see "sharing" in the title bar. Repeat the previous steps to unshare. You'll see this message. I don't have a network right now to test and get screen shots on but I tested it during a previous class with a network. Essentially updates of other people's tasks are displayed when you save. Sometimes before. And sometimes there is a lock from another person but only temporarily. Mail merges work fine with spreadsheets as the data source. 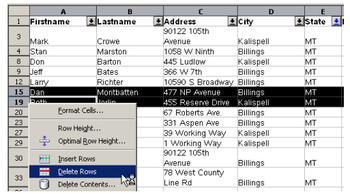 You create a spreadsheet of data, then choose File > New > Database, specify connecting to an existing database, Spreadsheet as the type, then click Next and point to the database itself. Here are a couple things about formats, though. Formats don't come through. So if you want your Salary field to have dollar signs, decimals, etc. you need to set the format. Likewise with date or time. One way to do this is just set the formats when you view them. Press F4 and expand to view the query or table you want. 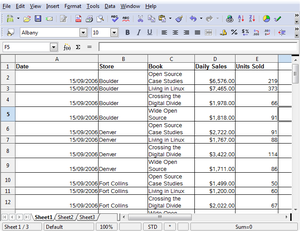 Then just right-click on the column heading and choose Column Format. 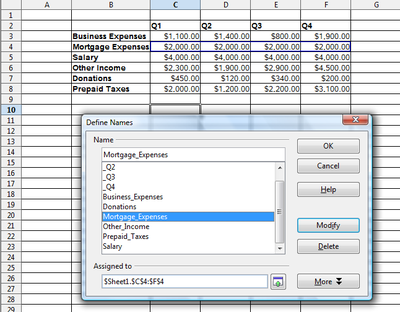 Then in the window that appears you can select a category (Currency, Date, Number) and the the specific format you want. Click OK.
You can do the same thing in the database file itself. Open the .odb file, click the Tables or the Queries icon at the left, then double-click on the particular table (the sheet or query). and in the window that appears, as before, make the choice you want. Click OK.
Now, here's a related topic. Can you use the =NOW() function in a spreadsheet and have it interpreted correctly in the database and in mail merges? (Thanks to a Colorado Springs LUG member for this idea.) The answer is Yes. Here's a spreadsheet with =NOW() showing the absolutely current time and date. Here's what it looks like, with nothing done to it, in the database view. It needs some tender loving formatting since it's just showing the internal numeric value. 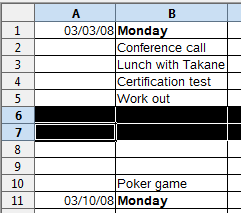 Right-click on the column heading and choose Column Format. Set the format you want. The NOW() function can let you use a date or time format since it contains both. And now it looks fine in the database view. and when I format it as a time. 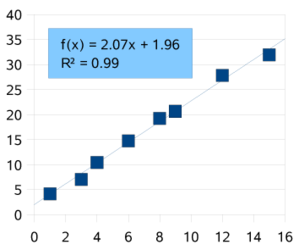 This PDF is from my Calc workbooks, and covers Data Pilots, Calc's version of pivot tables. You'll also need this lab file. Download it now, use it now. This is a beautiful program, a well-balanced combination of power, simplicity, good design, and ease of use. Thanks to Keith for pointing it out to me. There's no Windows or Mac version, sadly. Here's a screen shot with a summary of what you do. I'll do more detailed instructions later but here's the quick info. I love it. When it comes to cells, I like my content to look either like the first cell, or the second cell. If there's enough room for all the content; great. If there isn't, I like a nice wrap. 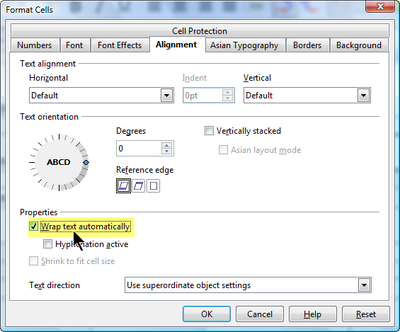 To wrap content in a cell, select the cell or cells then choose Format > Cells, Alignment tab, and select Wrap Text Automatically. If you've got just barely not enough room, you can also move your mouse over the right-hand border of the cell's COLUMN separator, and when it looks like this, double-click. Bam, the whole column will be just barely as wide as the widest cell in the column. Here are a couple other options that I just started looking at. 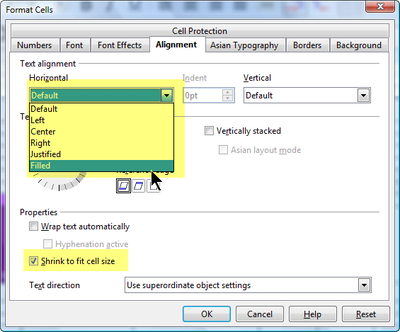 Shrink to Fit Cell Size, and for the horizontal justification, Filled. You get to them the same way you get to the wrap option: select the cell or cells then choose Format > Cells, Alignment tab, and select the options you want. Here's how each option looks. 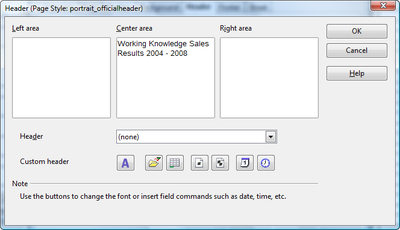 The demo content is in plain text and the explanation is in caps to the right of the relevant cell. Frankly I'm not sure how much I would use the Filled justification; seems a little dangerous. Thanks to Brian from Howard County Library for pointing this out to me. Let's say you've got a chart, and it's fine, but you're just not that jazzed about how it looks. You'd like a more Graphic Designer look to it. Here's how to break it down and do whatever you want to it. You've got this data; great new data on the number of users that use open source computers at the library branches. And you make a basic bar chart, or whatever kind of chart. And you can do some things. Double-click the chart, click on the element you want to delete, and press Delete. You can also right-click on things like the background, choose Object Properties, and choose Invisible instead of a line and click OK.
Another option, for adding text boxes, is choose View > Toolbars > Drawing. 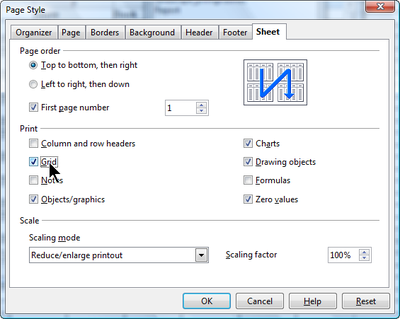 Click the T text box tool and draw a text box near the chart and type immediately. 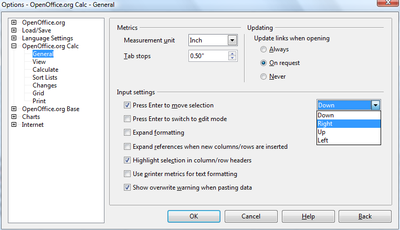 Then drag the text box over the chart. But here's the thing you can do in Draw. Copy the chart; just click on it once and copy it. 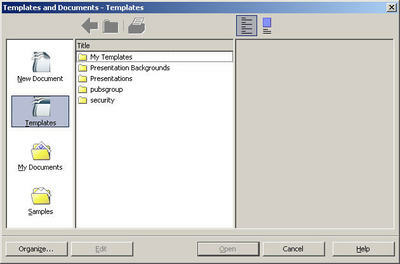 Then choose File > New > Drawing and paste it into the main slide work area. Right-click on the chart and choose Break. And now you can click on any particular part and just delete it or reformat it. You could get to something like this. 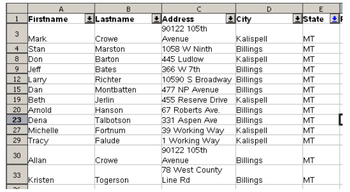 For the longest time, the really easy way of bringing database content into a document didn't work in Calc spreadsheets. At least, not for me. But now in 2.4 it does. So here you go. It's the same approach you use in Writer, just a little more limited. Choose View > Data sources or press F4. Expand the DB you want, then the table or query you want. 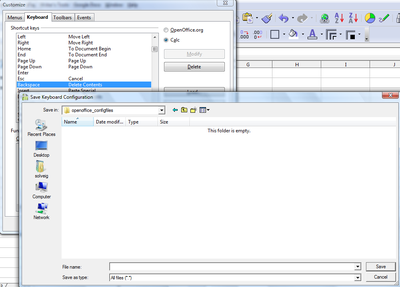 Select the table or query name. Click on the upper left corner as shown, the un-obvious little gray square. Click and hold down and drag into the document. And you'll get your data. So there you are. You've got a whole bunch of people signed up for various events you're planning. Or they've ordered a bunch of your products. Some have signed up for more than one event; some have ordered more than one product. You want to just get a list of the customers who've signed up. If a customer has signed up for three events, you just want her name to appear once. You just want the unique values. One thing you can do is use the Standard Filter. Select the column of data, either with the heading or without. Choose Data > Filter > Standard Filter. Select None as the Field Name then click More. 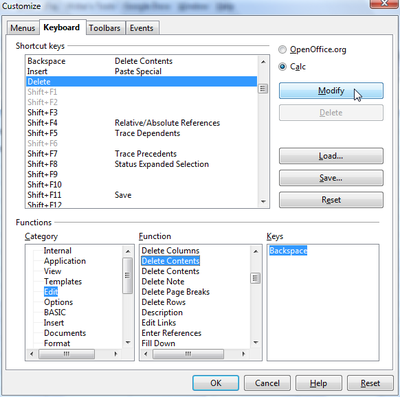 If you didn't select a column heading like Customer, deselect Range Contains Column Labels. 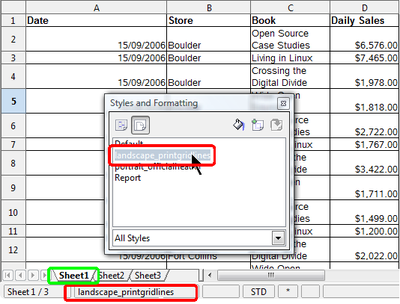 Select Copy Results To, click in the empty field, then either type the sheet and cell where you want it copied, or click in the cell in your spreadsheet where you want it copied. You'll get only the unique values from that cell range, pasted starting at the cell you specified. Tired of those pesky gridlines being displayed onscreen? Here's how to turn them off. Thanks to Marek for pointing this out -- I like to consider myself the queen of "it's under tools > options" but I only looked under the View menu before resorting to hack measures. Choose Tools > Options > Calc, View. Deselect Grid Lines. You can change the color of the grid lines here, too. Note that by default, they don't print. 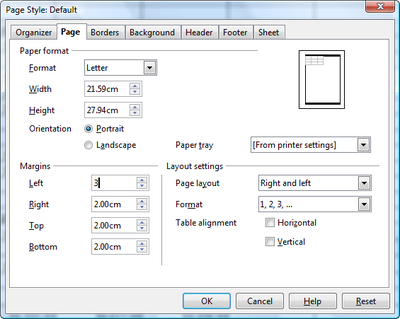 To make them print, choose Format > Page, Sheet tab. Who doesn't love a formula like this? Now, the math is fairly complex and I just made it up to look extra complex, but just looking at it, you're not sure what it's referring to. If you used names, which let you give more clear, descriptive names to parts of your spreadsheet, it could look like this. That's all very well, but how to do you add the names? 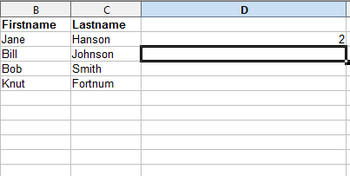 You can assign any name you want by selecting one or more cells and choosing Insert > Names > Define. 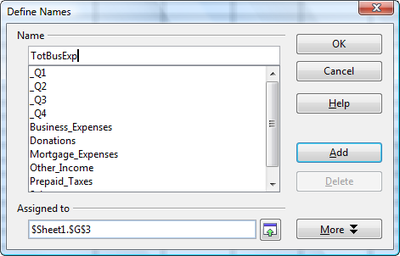 Type the name, click Add, and click OK.
Then you can create formulas like this. You'd need to create more names to refer to just the totals. 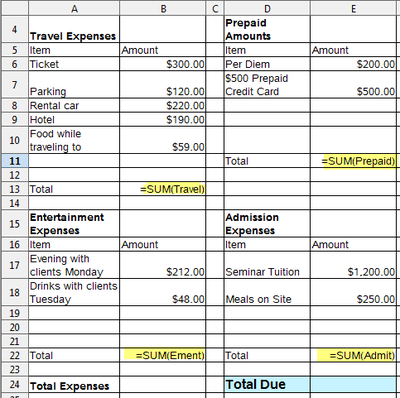 You'd create another name for the total field where the =SUM(Ement) total is, so that then you can type =TotEment+TotAdmit (total Entertainment Expenses plus Total Admission Expenses). There's a quicker way to get all your columns named. Let's say you've got this data. 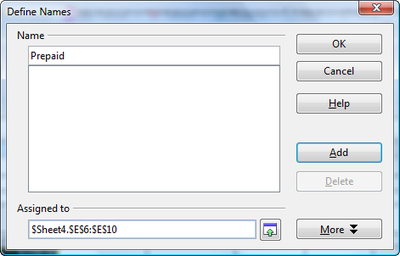 Select all the data and choose Insert > Names > Create. In this case it makes sense to select the checkmarks for top row and left column since that's where the labels are. 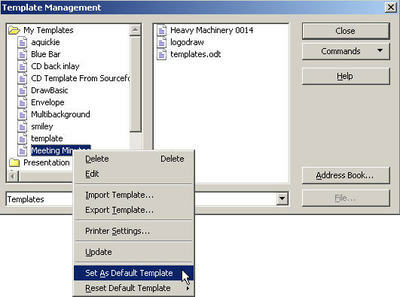 Then click OK.
To look at the names created, choose Insert > Names > Define. 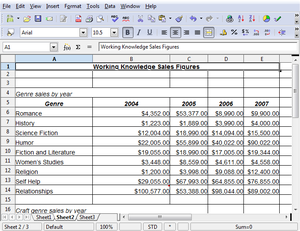 Now you can create totals, for instance, like this. Note that when you're in a formula and you start to type a name, it will appear in the Formula field as Prepaid_Taxes does here. Press Enter to accept it so you don't have to type the whole name. As mentioned before, you'll probably want to make fields to just refer to the totals. 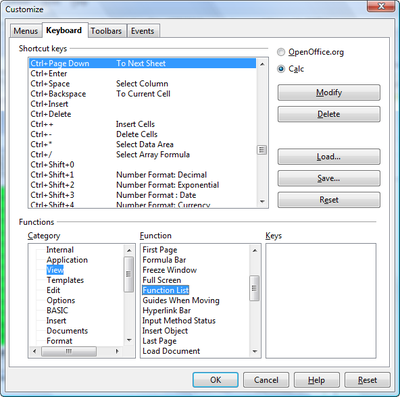 Select the cell and choose Insert > Names > Define. Type the name, click Add, and click OK. 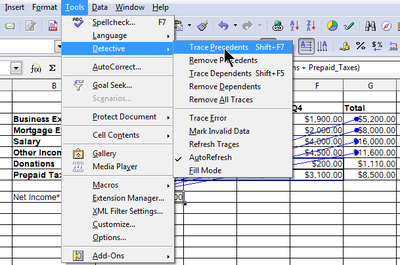 Tip: If you want some visual help figuring out where all those names come from, now that you don't have the cell references, you can choose Tools > Detective > Trace Precedents. 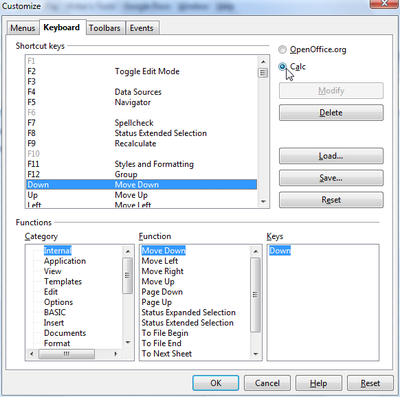 Inserting a row in OpenOffice.org Calc is easy. Let's say you've made this schedule and you need another row because you need more slots for night life. 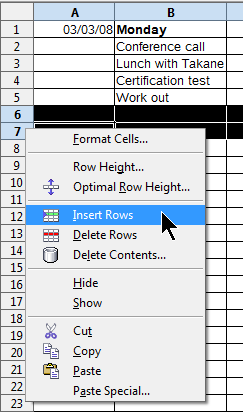 Right-click on the row below where you want the new row to appear, and choose Insert Rows. and then you get two more new blank rows. 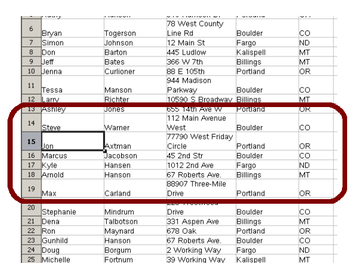 But then I had a brainwave -- you don't have to select blank rows in order to insert rows. That is, if you want to insert three new rows, just select three rows, period, whether they have content in them or not. 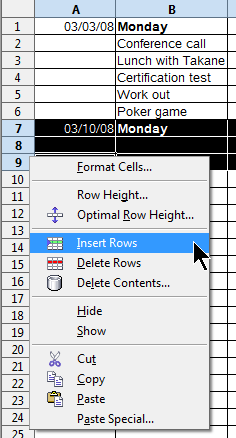 Then as usual right-click on the row headings and choose Insert Rows. and you get your three new rows, above the rows that you selected. I'm not sure how I got stuck on the idea that you have to select blank rows if you want to insert multiple rows at a time. But you don't. So here's the summary. 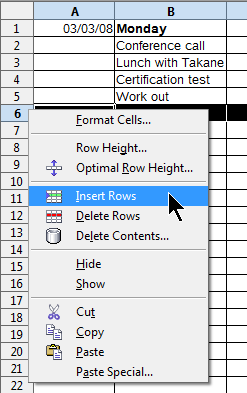 If you want to insert multiple rows, just select that number of rows, right-click on the row headings, and choose Insert Rows. Doesn't matter if there's content in the rows that you select; the content won't be affected by the Insert Rows action. 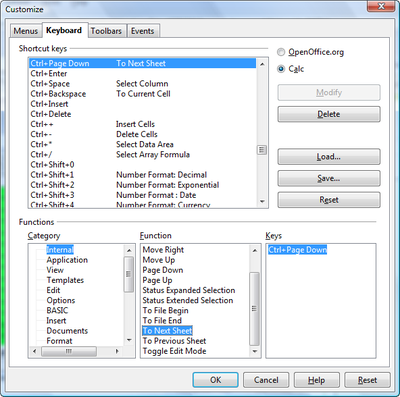 I get a lot of requests from people switching office suites who want to know how a feature is done in Microsoft Office, compared to how it works in OpenOffice.org. It usually ends up that the person wants a list of shortcuts. 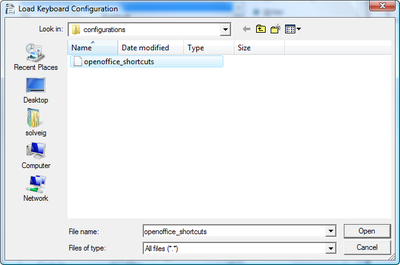 And I say "but you can have any shortcut you want in OpenOffice.org, it's incredibly configurable." I don't really like to give out lists like that because it gives the impression that it's fixed. If someone wants Ctrl 2 to make text double-spaced and they see it's assigned to the Heading2 paragraph style, they might think there's nothing they can do about it. 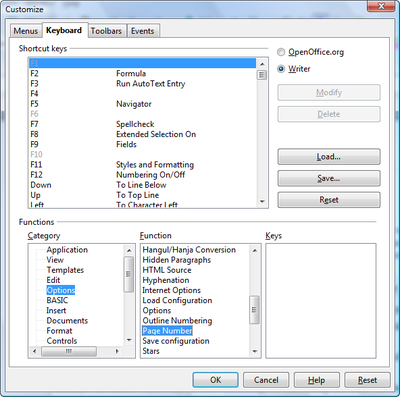 You can have virtually any shortcuts you want in OpenOffice.org. There are a zillion features you don't know about that you can apply shortcuts to. It's really easy to do. And once you've got it set to your preferences, you can easily give the file to your friends. 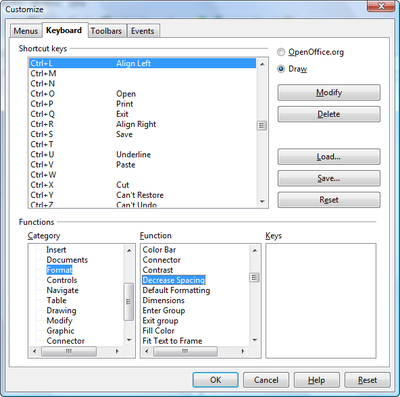 Choose Tools > Customize, and click the Keyboard tab. Those are the current shortcuts. 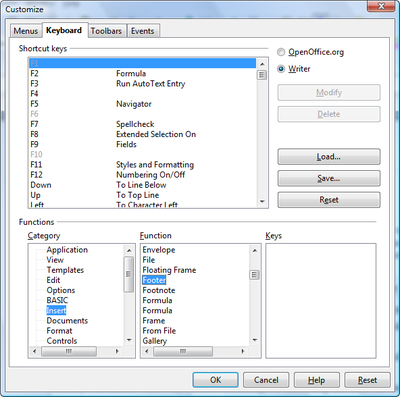 But to change one, just select something in the Category list, something in the Function list, the Keyboard Shortcut of your choice, and click Modify. Bam, you have your new shortcut. The world is your oyster. Sooooo many features that aren't on the menus or toolbars, and possibly not on the right-click menus, are in the Keyboard tab. As mentioned, choose Tools > Customize, Keyboard tab. 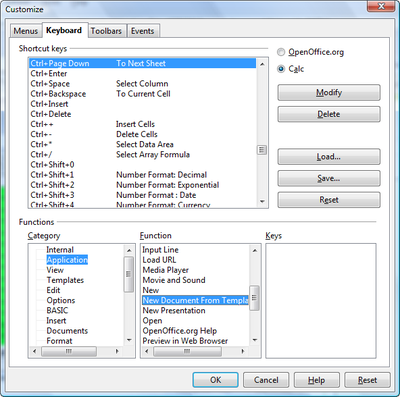 Select the first Category, and scroll through the Functions. Look at all that. You can set up any of those to use a keyboard shortcut you want, or you might see something you like that has a keyboard shortcut with it already. 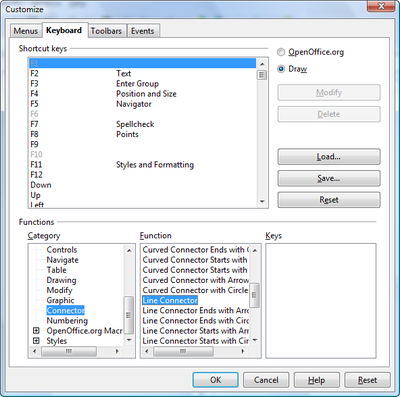 The keyboard shortcuts are different for OpenOffice.org in general, and for Writer, for Calc, for Impress, and for Draw. Here are just a few functions for Calc. 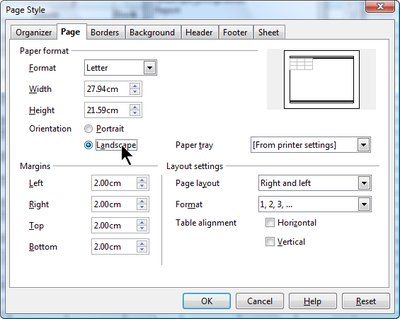 The first screen shot shows that it's Ctrl Page Down to go to the next sheet, and Ctrl Page Up to go to the previous sheet. You can use this as is or change it. All right. You've chosen Tools > Customize. You've clicked the Keyboard tab. You've scrolled through and found the feature for making line spacing doubled. And in the Shortcut Keys list you find Ctrl 2, the shortcut you want to use. It's already occupied by being assigned to Heading 2. That's fine. Just click Modify and it'll switch. Here's what it looks like now, with Ctrl 2 assigned to double-spacing. Now let's say you want to share this and any other shortcut configurations you've made with your friends, or all the folks you support in your job as an IT professional. * Name the file and click Save. 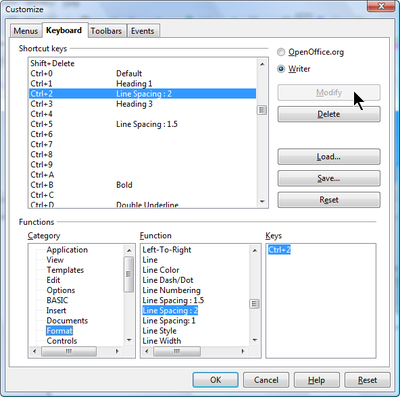 * Choose Tools > Customize, Keyboard tab. Want to give this post a plug on FSDaily? Let's talk spreadsheet page layout. Doing it simply is simple enough. Choose Format > Page, and make your changes. 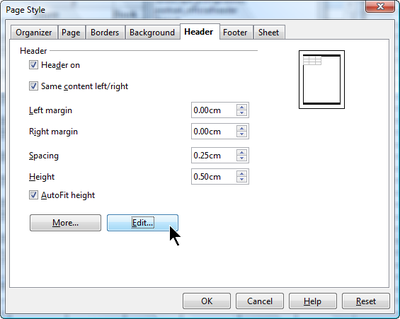 Margins and orientation in the Page tab; Headers in the Header tab; Borders around the content in the Border tab; etc. But....what if you've got content in a couple different sheets of your spreadsheet, or more. Let's say that the data in the first sheet is pretty wide so you'd like a landscape layout, and the data in the second sheet is narrow and a different type of information, so you'd like it not just portrait but with a different header. 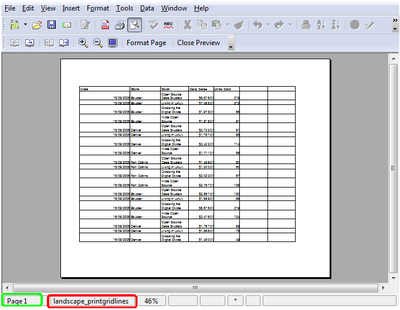 You want different page layout in each sheet of your spreadsheet. Well, the way I just showed you won't work because the changes apply to the entire spreadsheet. The reason that the changes apply to the entire spreadsheet is because the Default page style is applied to every sheet in the spreadsheet. 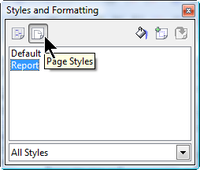 (A page style is just a group of formatting attributes associated with a style name.) And when you choose Format > Page, even though you might not be thinking about styles at all, you're modifying the Default page style. How to get around this? Well, you just need to have one page style on the first sheet, one page style on the second sheet, and so on. That way when you modify one page style, you're not affecting the other sheets because the page style is only applied to that one sheet. All right. Enough description. Here's exactly how to do it. Just so you see the sample, here's my spreadsheet. The first tab has a few pages of sales data; the second sheet, with different and less data, is more of a summary set of data. Choose Format > Styles and Formatting. Click the Page Styles icon at the top. Right-click in the window and choose New. Set attributes for the style. Click OK. 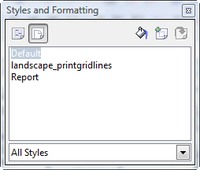 The style appears in the Styles and Formatting window. Now make another style, the same way. Name the style. Click OK. 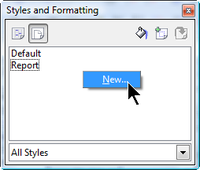 The style will appear in the Styles and Formatting window. This is pretty simple. Click on the tab for the first sheet, and in the Styles and Formatting window, double-click the page style you want to apply. 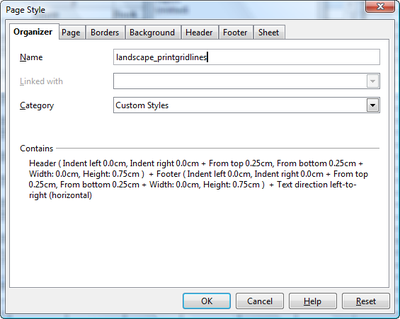 Then click on the tab for the next sheet, and double-click the style for that sheet. If you want to have one style for one sheet, and another style for three other sheets, just keep going, applying the appropriate style each time. Now you can see in Page Preview that the layouts are different. Choose File > Page Preview. Here's the layout for one of the pages in sheet1. 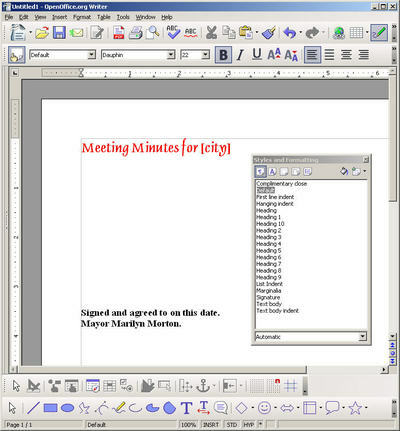 I came across this while working with a spreadsheet that was perhaps a little too fancy to come over from Excel to OpenOffice Calc. You want to add up all the items that are in one particular category since you want to know how much you're spending on music festivals; how much on climbing related purchases; etc. But the items are entered like this. Not really well categorized. You enter all your information however you want, just make sure you have a column, as shown above, to indicate the category. 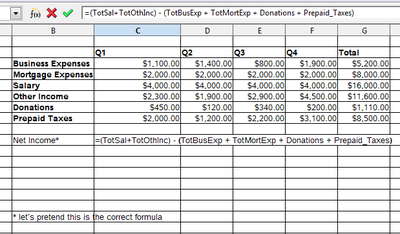 Then you have a separate summary section (or placed wherever you want) for the totals. This one shows the totals already there. 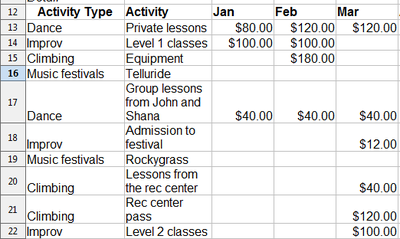 How do you get the total amount you're spending on dance in January, and on climbing in April, in there? 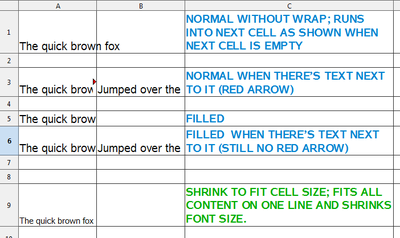 Here's an example in the spreadsheet, with the colored squares showing the cells or cell ranges being referenced. Note that the month is March for both the result of the calculation and for the range being added; they're just not above each other. 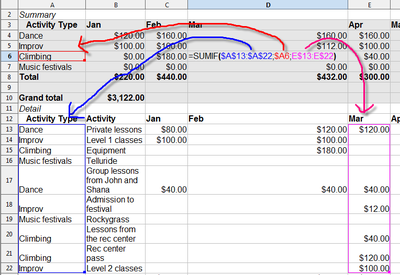 I also used absolute column and cell references by putting a $ in front of whatever column or row should stay the same. 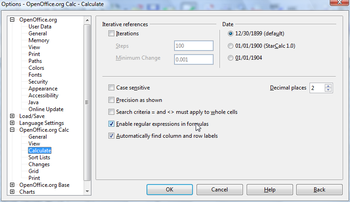 This let me drag the cell to create the calculation for every summary cell in the summary section. If you'd like to play with the spreadsheet, here it is. Right-click on the link and choose to save it to your computer. I posted a blog here about how to modify OpenOffice.org Calc to make the Delete key just delete, and another key like the Backspace key bring up that little delete window. Here's another little modification. A lot of folks who use Excel are used to pressing Enter or Return to go down one row and all the way to the beginning of the row. If you're on E4 and press Enter, then you are suddenly at F1. When you press Enter in Calc, however, you just go down one, like from E4 to F4. You can go under Tools > Options > Calc > General and change what the Enter key does, but you can't change it there to doing it the Excel Way. 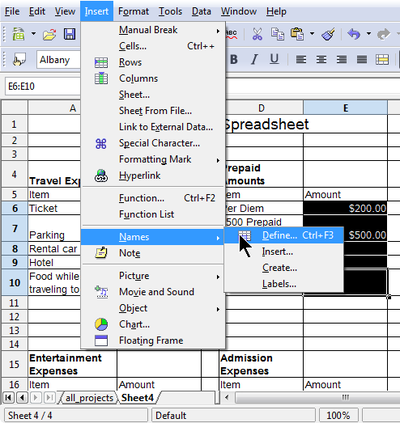 However, to go to the first cell of the next row almost as quickly in Calc as in Excel, you can press Enter, then Home. On my keyboard they're pretty close together. Enter takes you down one cell, and Home takes you all the way to the left of that row. 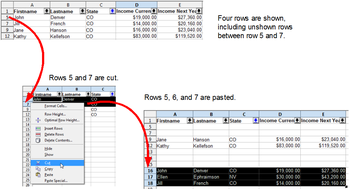 In Excel and in Calc, you can create a carriage return, aka line break, to go to a new line within the same cell. You do this by pressing Ctrl Enter to go to a new line. However. 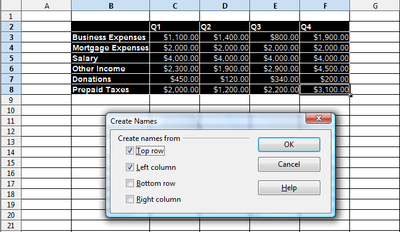 In Excel you can do this with your cursor in the input field at the top or in the cell. In Calc, your cursor needs to be in the cell. Also (thanks to a reader for a note on this). One occasional issue. This applies rarely and only if you've got some serious spreadsheet action. But keep in mind that the carriage return will sometimes be interpreted as a space. Do you care? Probably not if you're not running any evaluations of that cell. But keep this bug in mind. It's the little things, isn't it. 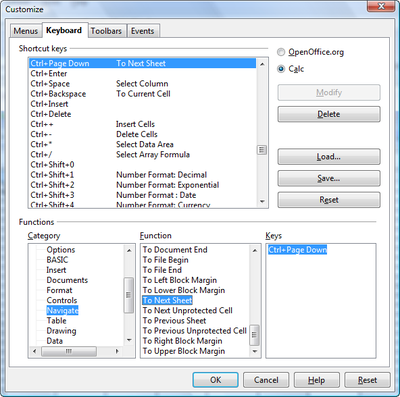 In OpenOffice.org Calc, you have to press Backspace to delete cell contents instead of pressing Delete like in Excel. Press Delete in Calc, and you get a Delete window that lets you delete formats, text, formulas and/or other elements, a very useful feature. It just might not be quite what you expect. Some folks note this as one of the issues with OpenOffice, like the Delete key thing. That blog certainly isn't the only one; I'm just listing it as an example and to....well, just keep reading. I think Greg C's point in the blog is just that the Delete-versus-Backspace is an unnecessary difference from MS Office. 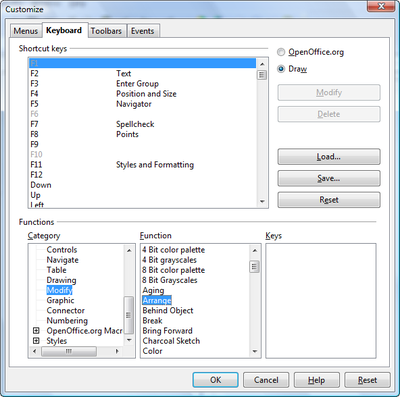 Would it make sense to set up the OpenOffice defaults to be the opposite way around? Sure. Did Novell swap it around in their version? Yes. Is it still a good idea to consider switching to OpenOffice to save thousands or millions of dollars, even if your users will have to change how they do some tasks? Yes. But honestly, is having to learn to press a different key all that big a deal? Really? Besides. 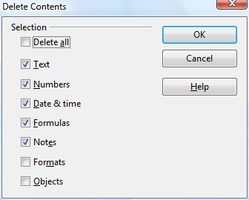 Can you change OpenOffice so that when you press Delete, the contents of the cell(s) are just plain deleted, like you expect? Yes. Either follow these steps, or skip to the end and download the configuration file. Load it according to the instructions at the end. 2. Be sure that the Calc radio button is selected. 3. In the Shortcut Keys area of the window at the top, select Delete as shown. 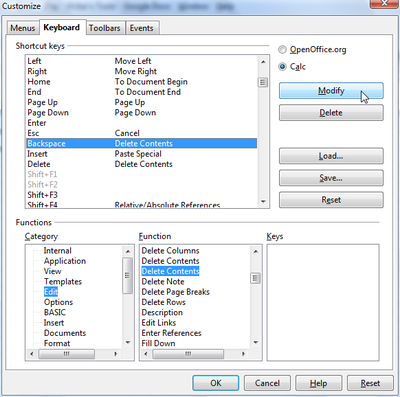 In the Functions area of the window at the bottom: under Category select Edit, and under Function select the FIRST of the two "Delete Contents" items. This is the one that just deletes, bam, with no window. 4. Click Modify. You'll see Delete now listed as a key. 5. If you don't want Backspace to delete contents, then select Backspace in the Keys list in the lower right corner and click the Delete button. 6. Now scroll through the Shortcut Keys list at the top and find a function you want to use to bring up the Delete window. It can be Backspace, or Ctrl 8, or whatever you want. 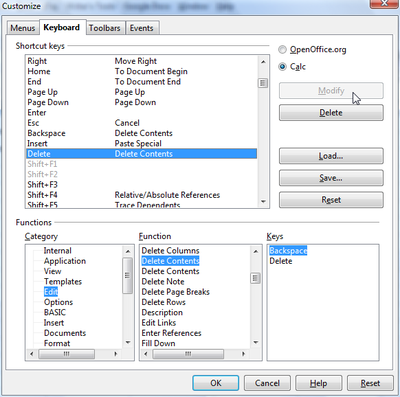 Then in the lower part of the window, as before, under Category select Edit and under Function select the SECOND "Delete Contents" item. 7. Click Modify. Your new selection will be the one that brings up the interactive Delete window. 8. 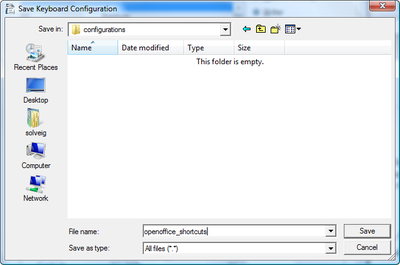 If you want to share this configuration with others, click Save and name the file in the window that appears. Here's mine--right-click on that link and choose to save the link target to your computer. Loading the Configuration File Give the configuration file to your friends. 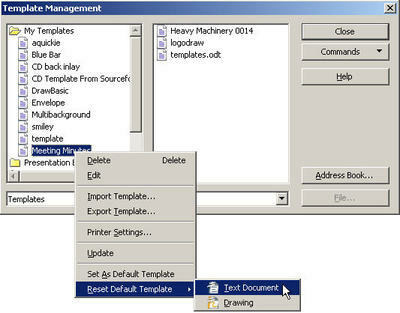 They should choose Tools > Customize, Keyboard tab, and click Load to load that file. Then they'll be happily pressing Delete, as well. I could have sworn I had posted this already, but I think it was just included in a comment on this post. Let's say you've got a big list of employees: name, address, etc. When you apply the filter and view, for instance, only people from Montana, some of the data isn’t shown. If you then copy, paste, delete, or perform other operations on the data, what happens to the data that isn’t shown? If you delete Artie Anderson from Montana and Cindy Chalmers from Montana, what happens to Betsy Bates from Nevada? It all depends on the operation. Some, like delete, leave the unshown data alone. Some do affect the unshown data. Operations that DO affect filtered out rows. 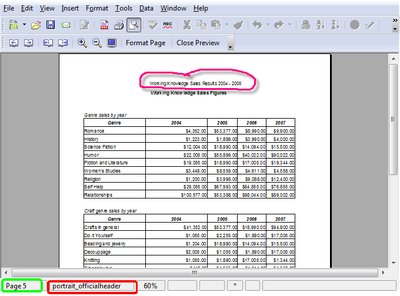 With Cut and Paste, the non-shown data is cut and also pasted. When you paste the data outside of the filter range, the whole set of data is pasted and unaffected anymore by the filter. When you paste the data inside the filter range, the whole set of data is pasted, and all data is shown at first, even data that shouldn’t show for the current filter selections. However, if you re-apply the filter selections using the dropdown lists in the heading row, then the data is filtered correctly. Click the following to see a bigger image. With Copy and Paste, the behavior is different. If you cut, you get the nonshown rows, but if you copy, you don’t. 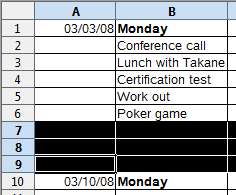 When you move rows (dragging) that include unshown rows, the behavior is the same as cut and paste. The unshown rows between shown rows are moved along with the shown rows. Here’s what happens with Fill. Here’s some sample data, and currently everyone is in the same department. You now look at only people from Colorado. You change the department for the first person from Colorado, and drag that department down through all the other people from Colorado. Now, all the nonshown rows after the first row you changed are affected, but not the rows before that. 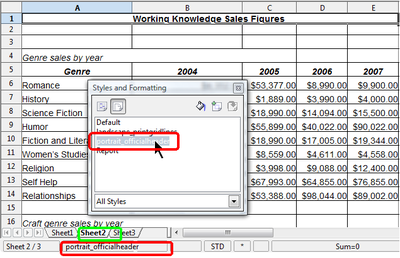 Copying and pasting, deleting, formatting, and Find and Replace don’t affect unshown data. The following section provides an example. Here’s a walkthrough of deleting rows while the filter is on. Rows that aren’t shown aren’t affected. Look at the range from row 15, Dan Montbatten, to row 20, Beth Jerlin. Dan and Beth are both from Montana. In between are Jon, Marcus, and Kyle. The next illustration shows an AutoFilter with only people from Montana, which includes Dan and Beth but excludes the three rows between. Now delete Dan and Beth. And they go away. However, when the state autofilter criterion is removed, Jon, Marcus, and Kyle are still there.